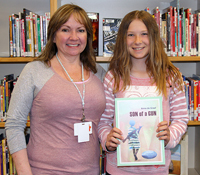 Abigail Kirk, a sixth-grader at Wood River Middle School, has won third place in a statewide writing contest for her essay to the author of “Son of a Gun,” a historical novel based upon true stories of children being kidnapped and forced to become soldiers in war-torn Liberia. The “Letters for Literature” competetion is sponsored by the Idaho Commission of Libraries. Student competitors were required to write to the author, living or dead, of a book, poem or speech and describe to the author how they were affected by the work. Kirk wrote her letter to Anne de Graaf, author of numerous books for young readers. Her book “Son of a Gun” was published in 2012. It describes the ordeals of 8-year-old Lucky and his 10-year-old sister Nopi, who were kidnapped to become child soldiers during Liberia’s long civil war. The children eventually escape and return to their parents, but their lives were never the same. The book is based upon true stories of former child soldiers interviewed by de Graaf. She wrote that the book made her appreciate things that people often take for granted, such as a home and plenty of food. Kirk wrote that the book also provided her with new insights about life. “You have inspired me to see things as they are, not how they want to be seen,” Kirk wrote.